Do not say I didnt warn you because I did. I warned that this update and tomorrow mornings should I choose to post it would be boring and there would not be many pictures, and that turned out to be the case. This evening I had to spend my remaining yen, leaving enough for breakfast and lunch tomorrow as my flight is not until 3pm. To achieve this spending (I really struggle to spend money!) I went to Mitsukoshi (basement), Taskshimaya (basement) and then the Tokyo station mega mall complex (basement). As is the case with nearly everything in Japan, no matter what you buy, you are mainly paying for packaging. This is especially the case when you are buying cheap crap for a few dollars each. These sorts of things are already wrapped in too much packaging, and then despite spending about $5, they gift wrap it for you, and put it in a bag, and tape up the bag. 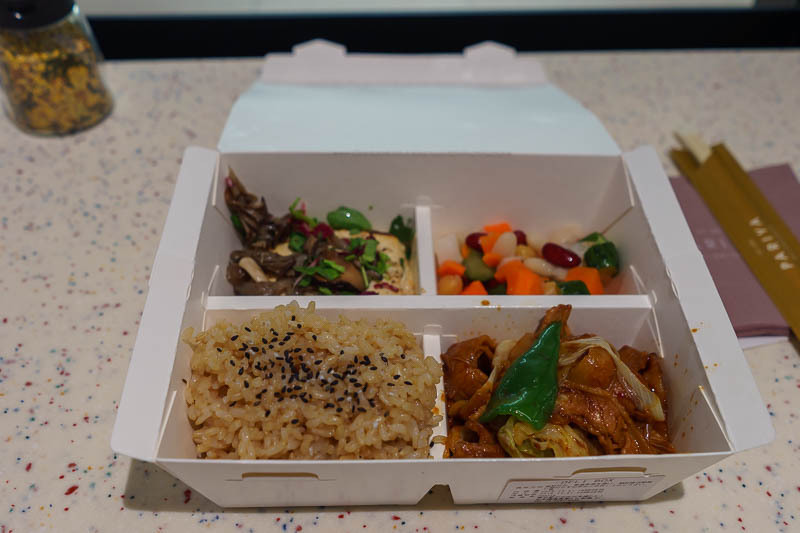 I also managed to have a boring healthy dinner, regret that I did not have a healthier dinner and then photograph my healthy snack choice - the snack I eat a lof of when in Japan. THRILLING STUFF I AM SURE! Now for a tiny amount of boring photos! Tonights cat. Wait. I forgot to do the cat thing the last few days. I actually saw a real cat today but he stayed just out of range as I followed him around the giant Buddha. 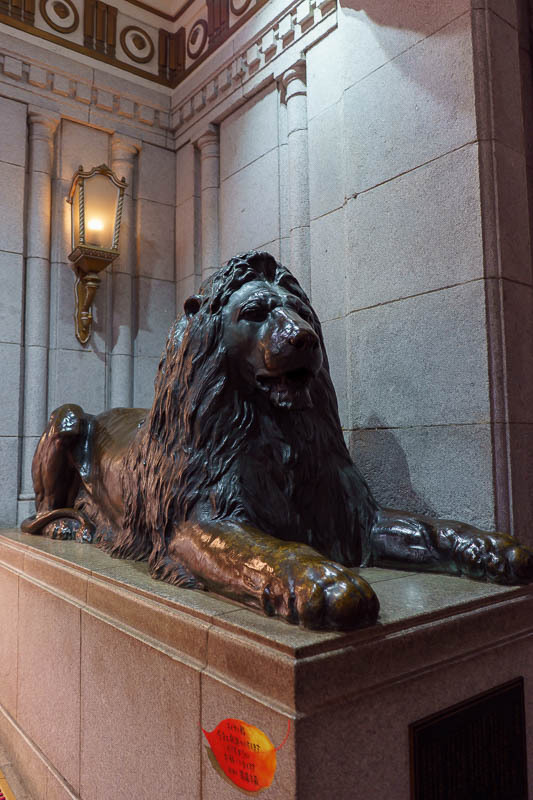 Tokyo does not have the same level of cats as the other parts of Japan, so the best I can do is a lion statue. Did I already take this photo? 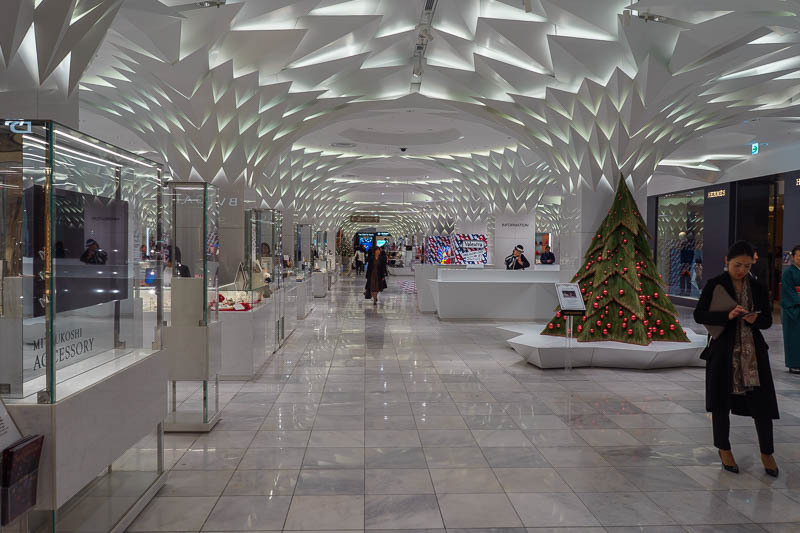 The inside of Mitsukoshi is blinding! I could not bare to go in for more than a few seconds to take this photo. It is brighter than direct sunlight. 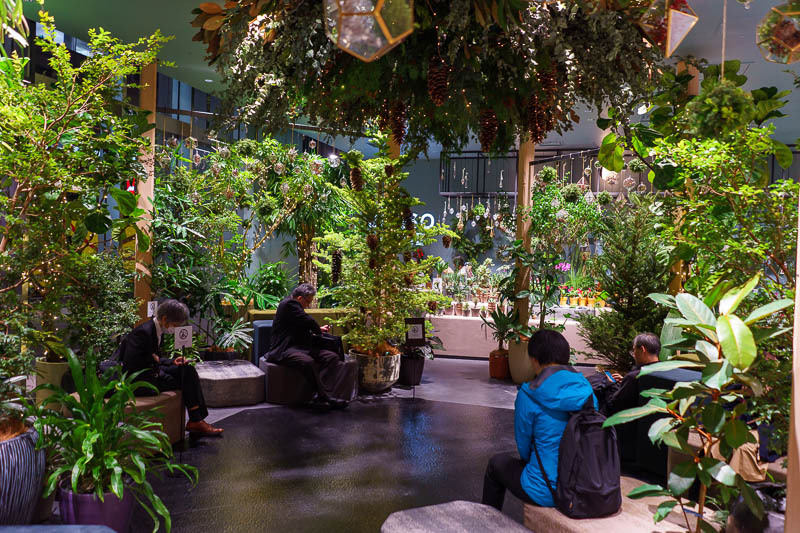 Meanwhile, down the road at Takashimaya, theres a forest in annex building 3a. Both these department store complexes span multiple blocks. 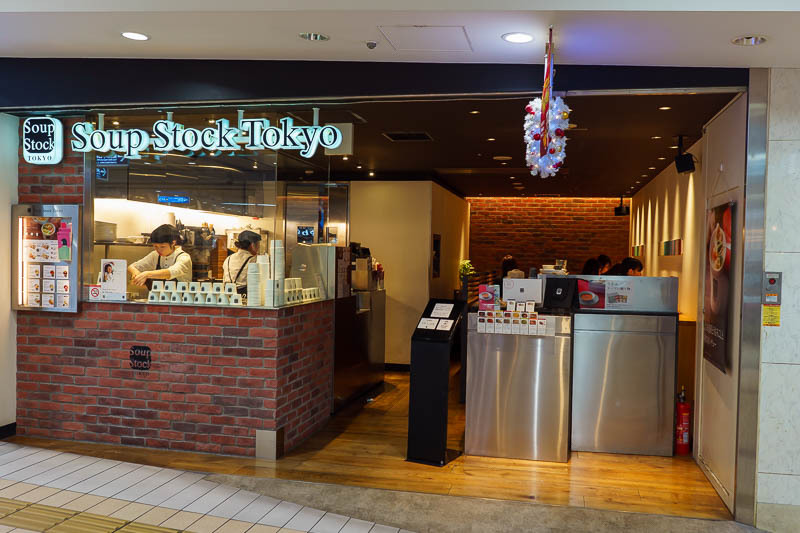 Mitsukoshi even has its own Subway station named after the store. Basement level 2 in the Takashimaya annex had a healthy restaurant zone. I chose a choose your own adventure dinner box. It is just like the Korean place at Emporium in Melbourne, you choose your rice style, your main course, a salad and a side dish. As you can see I chose brown rice, with some sort of pork and cabbage, a block of tofu with mushrooms and some pickled mix vegetables. It was really very delicious! If I lived here I would probably eat here often. 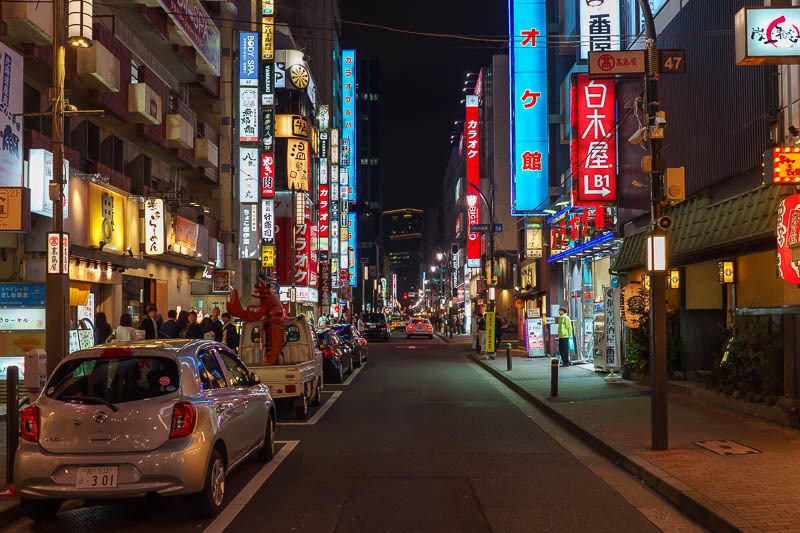 The final neon photo is... a rather typical back street around Tokyo station. Some of the business men here are already very drunk at 8pm. Lightweights. Well I thought I had a great dinner, but then I realised nearby I could have had the 2 soup combo again! My most eaten food of this trip? Probably a tie with Ramen. The soup is healthier. 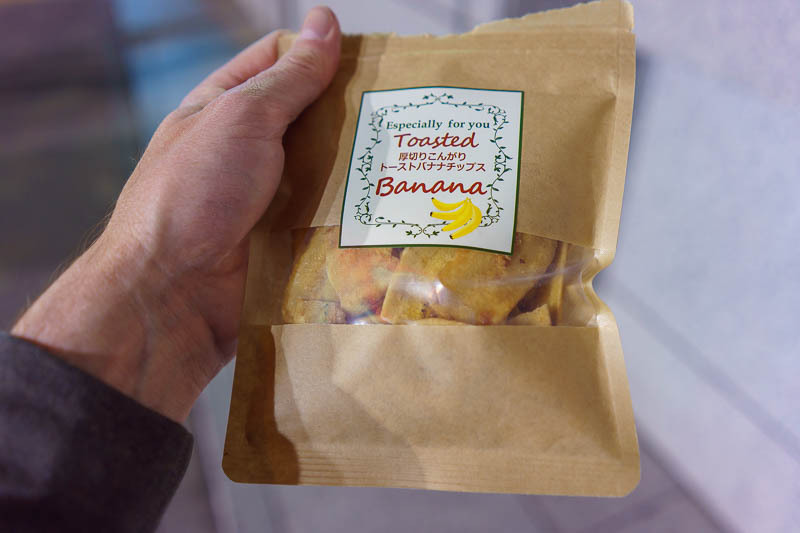 And because my hands were full of packaging, I had to put it all down to tear into my healthy snack of air baked banana chips. I eat this often in Tokyo, it can only be purchased from the purple colored Lawson natural. You can see here that I tried to rip into it one handed and failed. I also eat it while walking along in the street, which upsets all the locals! If you are in Tokyo I highly recommend the Lawson natural convenience stores, which have purple signs and a bigger range of interesting things. The range is almost completely different from the standard Blue colored Lawson stores and the larger green and white Lawson 100 stores. I am an expert on convenience stores.